At the Summer Concert at Standley Park featuring Rifftide on Sunday, July 31, the intermission was filled with thanks and recognition. John Schindel, president of the Standley Recreation Council welcomed both the audience and Rifftide and thanked them for their support. Barry Bernstein, UCCA president, then took the stage and thanked and expressed support for the San Diego Police Officers, especially Northern Division. Audience members gave the Sargent on Duty a standing ovation as a show of appreciation. Barry also thanked Scripps Health, as represented by Amber Ter-Vrugt and her family, for their ongoing support of the Summer Concert Series. Sherri LIghtner, City Council President, was introduced and in a surprise to both Barry and the audience, Sherri proclaimed Sunday, July 31, to be “Barry Bernstein Day” in San Diego in recognition for his ongoing leadership with University City Community Association. 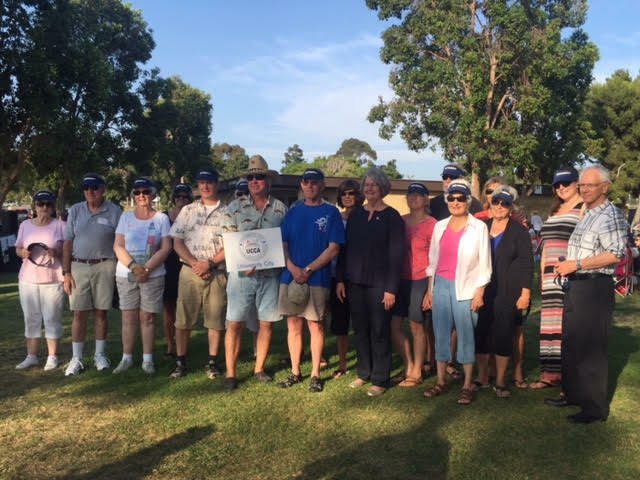 Sherri also thanked UCCA’s newsletter delivery and Neighborhood Watch volunteers and UCCA presented each of the volunteers with a volunteer sun visor. County Supervisor Dave Roberts was then introduced and spoke of the “Live Well San Diego”, the County’s vision for a healthy, safe, and thriving county for all residents. He spoke of one of the County’s recognized Live Well partners, Voices for Children, and the street banners from Voices for Children, that are currently displayed on light poles throughout University City. Dave then announced that University City Community Association, represented by Barry, and vice president Diane Ahern, was being recognized as a “Live Well San Diego” partner for the events and projects that the organization initiates and sponsors that are in alignment with the goals of a healthy, safe and thriving community. Roberto Ramirez, UCCA’s Live Well liaison, shared in the recognition. After many pictures and much applause, Rifftide was able to retake the stage and complete their concert.